Mingara Recreation Club is a focus of sporting and social activities on the NSW Central Coast. This decorative arch identifies the entrance to a children’s play area within the club. Architecture and design firm, Luchetti Krelle, provided the concept and Di Emme interpreted and built the playful sculptural artwork. The framework is hand sculpted from 6mm steel rods finished in bright silver with 300 individually welded tabs for mounting the hundred-plus 3mm-thick acrylic panels. 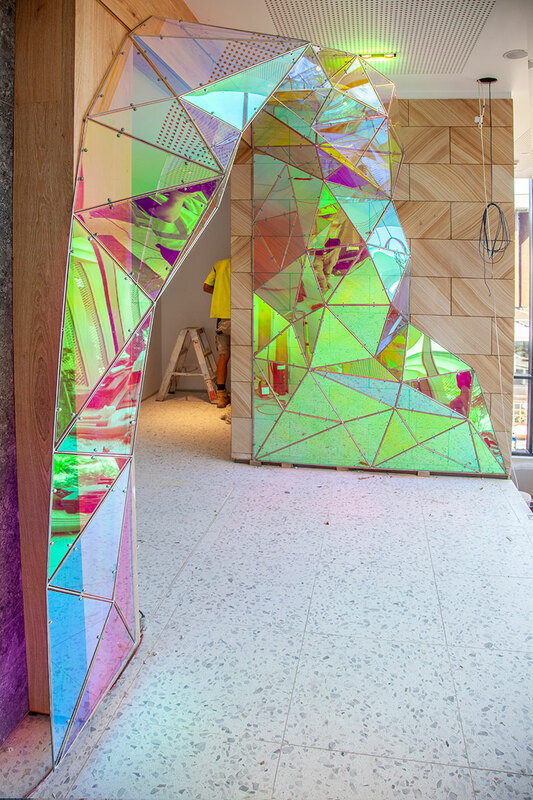 Di Emme applied 3M Dichroic Film to the panels to create the visual effect. The multi-layer optical film colour shifts when viewed from different angles, imitating the appearance of dichroic glass without the cost and fragility.